Mix & Mingle Show packages available through Children's Party Ents Ltd. Mix & Mingle for Promotions Product Launches and Store Openings. Our stilt walkers drumming up trade, who can be seen from afar attracting customers to your store or stand. Our close up magician’s astounding your customers in your store or showroom using props that contain your company’s logo or brand. One thing that is guaranteed, we will help you to get your message across to your customers in a fun way that will be remembered for a very long time. At special events, our entertainers are usually very often asked by local newspaper photographers to be in pictures because of their colourful costumes. This generates great FREE publicity for your store or new product through the media. Visual aids, that get people through your door! 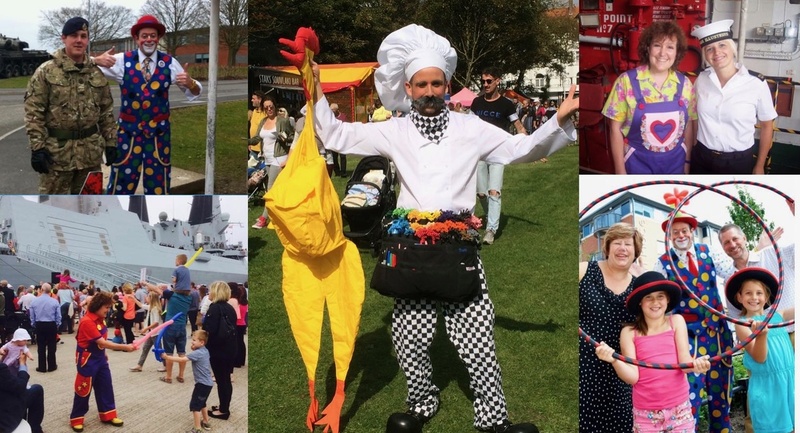 If you are promoting something where you need to attract customers a great way is to have a face painter and or a balloon modeller on hand. This way when your customers leave your premises and go out into the main shopping area other people will see the balloon animals and the children with their faces painted and will often ask where they had this done, thus generating more customers through your door, increasing footfall. We found Children's Party Entertainment via Google search, we called them and in short notice they were able to provide exactly what we needed. Very professional entertainers arrived, and did a fantastic job interacting with the children, a great day was had by all, I would recommend them again.